24 Marlborough is located on the south side of Marlborough, between Arlington and Berkeley, with 22 Marlborough to the east and 26 Marlborough to the west. 24 Marlborough was built ca. 1863, one of five contiguous houses (22-24-26-28-30 Marlborough) built as a single block, with a rusticated stone base at the first story with arched entryways and windows, and a heavy cornice at the roof line. 24-26 Marlborough were built for Edward Ingersoll Browne, and 28-30 Marlborough were built for the estate of Augustus Thorndike, of which Edward Ingersoll Browne and Samuel Turner Dana were the trustees. All four were built for investment. Edward I. Browne was an attorney. He was unmarried and lived at 5 Allston and later would live at 52 Commonwealth. Samuel T. Dana was a commission merchant dealing in tea and other commodities, and also was agent for George Peabody & Co., London bankers. He and his wife, Mary Elizabeth (Crockett) Dana, lived at 3 Arlington. The land for 24-26 Marlborough and 26-28 Marlborough was purchased on March 25, 1863, from Caleb William Loring and Charles F. Choate, trustees for a real estate investment trust formed by them with Francis B. Hayes and Franklin Evans. The parcel was part of a larger tract of land with a 287 foot frontage extending east from Berkeley Street that the trust had purchased from the Commonwealth of Massachusetts on May 2, 1860. Click here for an index to the deeds for 24 Marlborough. On December 14, 1864, 24 Marlborough was purchased from Edward I. Browne by Elizabeth Cabot (Jackson) Putnam, the wife of Dr. Charles Gideon Putnam, a physician and obstetrician. They previously had lived at 6 Temple Place. Charles and Elizabeth Putnam’s adult children — Dr. Charles Pickering Putnam, Dr. James Jackson Putnam, Elizabeth Putnam, and Anna Putnam — lived with them. Charles Putnam’s sister, Louisa (Putnam) Peabody, the widow of Joseph Augustus Peabody, lived at 26 Marlborough, and Elizabeth Cabot (Jackson) Putnam’s aunt, Lydia (Cabot) Jackson, lived at 22 Marlborough (Elizabeth (Jackson) Putnam’s mother, Elizabeth (Cabot) Jackson, was the sister of Lydia (Cabot) Jackson; in addition, Elizabeth Putnam’s father, James Jackson, was the brother of Lydia Jackson’s husband, Patrick Tracy Jackson). Charles and Elizabeth Putnam both died in February of 1875. 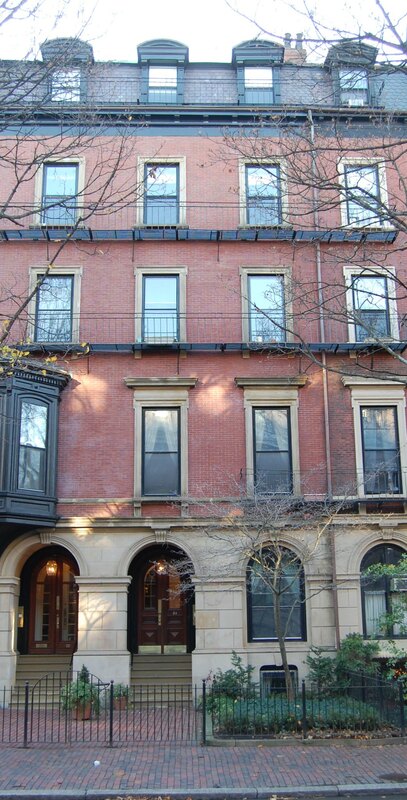 Soon thereafter, their children commissioned a new home at 63 Marlborough, designed by their first cousin, architect J. Pickering Putnam, where they moved in about 1876. They continued to own 24 Marlborough and lease it to others. By the 1876-1877 winter season, 24 Marlborough was the home of Dr. George Brune Shattuck and his wife, Amalia Diaz de la Torre (Schutte) Lavalle Shattuck. They previously had lived at 6 Newbury. He was a physician and editor of the Boston Medical and Surgical Journal. 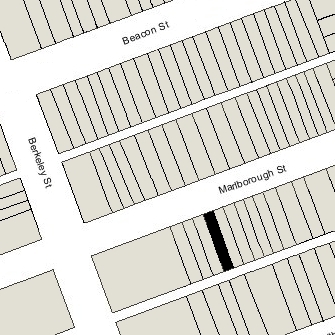 They continued to live at 24 Marlborough in 1889, but had moved to 183 Beacon by 1890. On March 9, 1889, 24 Marlborough was purchased from the Putnam family by attorney William Minot, II. He lived at 22 Marlborough. From that time forward, the two houses remained under the same ownership. For about the next sixteen years, 24 Marlborough was occupied as a lodging house for a number of single young men, who usually continued to live there until they were married. Among the first residents was William Minot’s son, real estate trustee Laurence Minot. He had lived at 25 Mt. Vernon in 1888, and before that with his father at 22 Marlborough. He continued to live at 24 Marlborough until 1901, when he moved to 409 Commonwealth to live with his niece, Katharine Minot, whose father, William Minot, III, had died in November of 1900 (her mother, Elizabeth Vredenburgh (Van Pelt) Minot, had already died, in September of 1897). Laurence and Katharine Minot continued to live together at 409 Commonwealth until her marriage in November of 1904 to attorney Henry Morse Channing. Thereafter, Laurence Minot moved to 144 Marlborough and the Channings moved to 142 Marlborough. Other longer-term residents at 24 Marlborough included: banker and stockbroker Charles Mills Cabot (from 1890 until his marriage in September of 1893 to Caroline Elizabeth Perkins, after which they moved to 374 Newbury); real estate broker George Edward Cabot (from 1890 through 1894, and again in 1898 until his marriage in April of 1899 to Eliza Tileston Hemenway, after which they moved to 169 Marlborough); attorney Bradley Webster Palmer (from about 1892 through 1906); attorney Ralph Emerson Forbes (from about 1892 until his marriage in January of 1901 to Elise Cabot, after which they lived in Milton); banker Elliot Cabot Lee (from about 1894 through 1898, when he moved to Brookline); physician Charles Allen Porter (who previously had lived at 128 Marlborough and lived at 24 Marlborough until his marriage to Margaret Cochrane Dewer in April of 1898, after which they moved to 254 Beacon); physician Dr. George Washington Wales Brewster (from about 1897 until his marriage in November of 1902 to Ellen MacKenzie Hodge, after which they moved to 277 Clarendon); attorney Laurence Henry Hitch Johnson (from about 1895 to 1903); real estate trustee Philip Cabot (from 1898 until his marriage in June of 1902 to Lucy Katharine Fuller, after which they moved to 297 Marlborough, which was the home of his brother, Charles Mills Cabot, who had lived at 24 Marlborough from 1890 to 1893); and wool merchant Lesly Augustin Johnson (from 1901 through 1906), the brother of Laurence H. H. Johnson. By the 1902-1903 winter season, there were four residents of 24 Marlborough: Laurence Johnson, his brother, Lesly Johnson, and Bradley Palmer, all of whom had lived there for several years, and a new resident, cotton broker George Atkinson, Jr.
Laurence Johnson married in June of 1903 to Leila Miller and they moved to Milton. By the 1903-1904 winter season, Bradley Palmer, Lesly Johnson, and George Atkinson, Jr., had been joined by real estate dealer (and future banker) Russell Green Fessenden, who previously had lived at 49 Hereford, and by wholesale cotton merchant John Silsbee Lawrence, who previously had lived at 59 Commonwealth with his father and step-mother, Amory Appleton Lawrence and Gertrude Austin (Rice) Lawrence. By the 1905-1906 season, they had been joined by lawyer (and future Lt. Governor) Louis Adams Frothingham. He previously had lived at 92 Bay State Road and, before that, at 20 Hereford. By the 1908-1907 winter season, all six had moved to 140 Beacon. On December 22/23, 1905, 22 and 24 Marlborough were acquired from the estate of William Minot by Rachel Ewing (Sherman) Thorndike, the wife of Dr. Paul Thorndike. They previously had lived at 244 Marlborough. Paul Thorndike was a physician and later also a professor at Harvard Medical School. Rachel Thorndike was the daughter of General William Tecumseh Sherman. Their three children — William Tecumseh Sherman Thorndike, Martha Thorndike, and Anna Thorndike — lived with them at 22 Marlborough, and he maintained his office at 24 Marlborough, where he also rented office space and lodgings to other physicians. By 1907, 24 Marlborough was the home and medical offices of Dr. Louis T. Wilson, a physician. He continued to live and maintain his medical offices at 24 Marlborough until his death in June of 1909. In 1908 and 1909, architect William Chester Chase also maintained his office at 24 Marlborough. He and his wife, Adelaide Angelique de Pelgrom (Cole) Chase, a still life and portrait painter, lived at 95 Beacon, where he previously had also maintained his office. In October of 1908, they purchased 8 Marlborough and by 1910 they had moved their home and his office there. By 1910, 24 Marlborough was the home and medical office of Dr. Daniel F. Mahoney, a physician. He married in October o 1910 to Mary Beatrice Dacey, a nurse. After their marriage, they lived at 24 Marlborough until about 1913, when they moved to Brookline. He continued to maintain his office at 24 Marlborough until about 1917. Among the other long term lodgers at 24 Marlborough was Richard Bryant Hobart, a shoe salesman and later an investment counselor, who lived there from about 1910 until his marriage in 1932 to Janet Elliott Wulein, after which they moved to Concord. 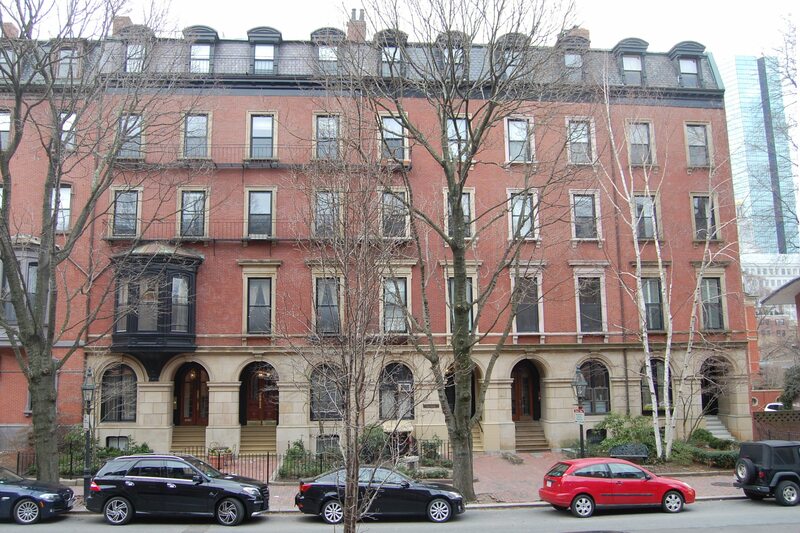 Richard Hobart’s brother, Philip W. Hobart, a bond salesman, also was a lodger at 24 Marlborough from about 1920 until about 1933, when he moved to an apartment at 31 Massachusetts Avenue. Also among the long term lodgers at 24 Marlborough was Robert Gardner McClung, a lawyer, who lived there from about 1913 until his death in March of 1928. Rachel Thorndike died in October of 1919. Paul Thorndike continued to live at 22 Marlborough with their unmarried children, William T. S. Thorndike, a physician, and Anna Thorndike. Paul Thorndike continued to maintain his office at 24 Marlborough, joined by his son. William Thorndike married in October of 1920 to Katherine Hunt. After their marriage, they lived in Brookline. 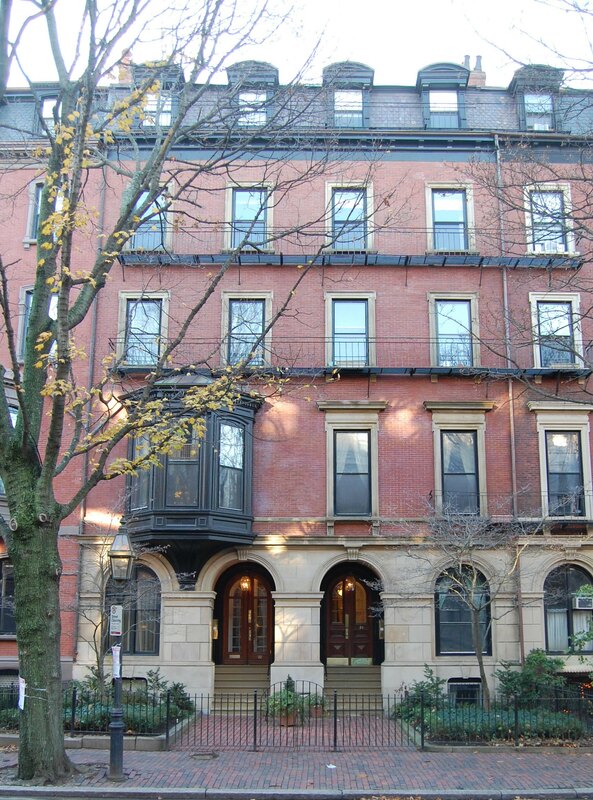 At about the same time, Paul Thorndike and Anna Thorndike moved to an apartment at The Austerfield at 7-9 Massachusetts Avenue (504 Beacon). Paul and William Thorndike continued to maintain their offices at 24 Marlborough. In about 1932, William and Katherine (Hunt) Thorndike moved from Brookline to 24 Marlborough (it continued to be a combination of lodging house and medical offices). They divorced in 1933, and William Thorndike continued to live and maintain his medial office at 24 Marlborough until about 1937, when he moved to an apartment at 221 Beacon. 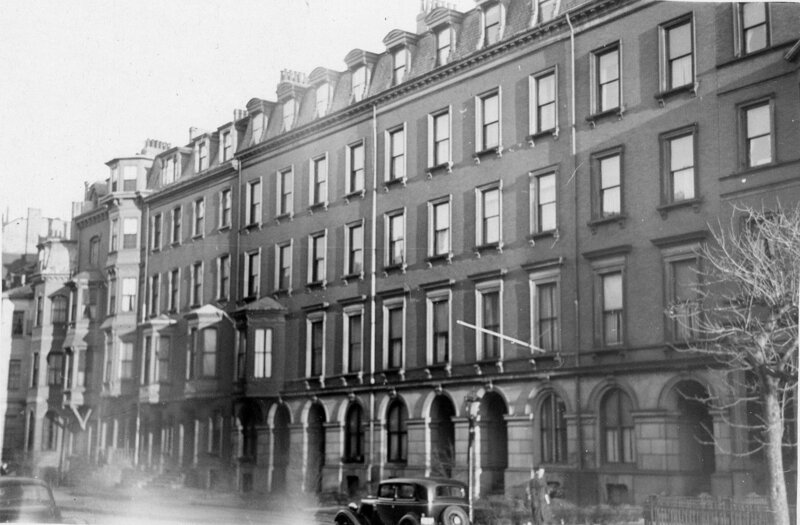 On April 28, 1936, 22 and 24 Marlborough were purchased from the Thorndike family by Shirley Clifford Speed, a real estate dealer who converted many Back Bay houses into lodging houses and apartments. On April 29, 1936, S. Clifford Speed sold an undivided half-interest in the properties to Mabel (Clark) Shaw Welsh, the wife of real estate dealer Willard Welsh. They lived in Malden. The properties continued to be operated as lodging houses. On May 1, 1939, 22 and 24 Marlborough were acquired from S. Clifford Speed and Mabel Welsh by Charles A. Sherwin, Jr., and his wife, Alfredda (Stoddard) Sherwin. He was a retired sales manager of a steel company. They previously had lived at 80 Marlborough. The Sherwins lived at 22 Marlborough and operated both properties as lodging houses until about 1948. On November 1, 1948, 22 and 24 Marlborough were acquired from the Sherwins by Mrs. Edna Mae (Reynolds) Candage Lovejoy Walsh Grant. She was the former wife of Henry (Harry) Wells Candage, the widow of Everett John Lovejoy and Dr. William Martin Walsh, and the former wife of Wallace Edwin Grant. Edna Grant lived at 470 Beacon, where she also operated a lodging house, and owned 220 Commonwealth and other Back Bay properties. In about 1951, she moved to an apartment at 220 Commonwealth. On October 1, 1951, she was arrested and charged with arranging for illegal abortions, working with three physicians who also were arrested. On November 15, 1951, Edna Grant transferred 22 and 24 Marlborough and her other properties to a trust she established for her benefit with Anna Louise (Day) Hicks as trustee. Louise Day Hicks was a real estate investor and operator of lodging houses. She and her husband, John Edward Hicks, an engineer, lived in South Boston. She later would become a well-known Boston politician. She was elected to the Boston School Committee in 1961 and was an outspoken opponent of using busing to integrate Boston’s schools. In 1967, she was an unsuccessful candidate for Mayor, but in 1969 was elected to the City Council. In 1970, she was elected to the US Congress, but was defeated for re-election in 1972. She was reelected to the City Council in 1973 and 1975, but then lost two successive bids in 1977 and 1981. On November 15, 1953, 22 and 24 Marlborough were acquired from Anna Louise (Day) Hicks, trustee, by The Work of God, a non-profit organization based in Chicago. On December 22, 1953, they transferred the properties to their Massachusetts affiliate, The Work of God, Inc. In June of 1954, The Work of God, Inc., applied for (and subsequently received) permission to combine the properties, cutting an opening in the party wall between them on the third floor, and converting them from lodging houses into a dormitory and chapel. They continued to be located at 22-24 Marlborough until the mid-1970s. On December 3, 1975, 22-24 Marlborough were purchased from The Work of God, Inc., by the Winthrop Financial Company. That same month, they applied for (and subsequently received) permission to convert the property into eight apartments. On August 3, 1976, the Winthrop Financial Company converted the apartments into eight condominium units, the 22 Marlborough Condominium.